What Can Be Done About IUD Placement Pain? If you have ever considered getting an IUD, chances are you have heard stories about uncomfortable insertion experiences. But while one woman may find it incredibly painful, the woman in the next exam room may feel only some minor cramping. In fact, 25-year-old Jessica Schuster has had two IUD insertions, and she found that even her own experiences were the complete opposite of each other. Jessica didn't really know anyone else who had an IUD when she got her first Mirena in 2011, but she was searching for a birth control method that was safe to use with her blood clotting disorder. “I was in college, so it was kind of whatever doctor was there and willing to help me out,” she said. She went into the experience not feeling especially nervous about it, but, unfortunately, the insertion was much more painful than she thought it would be. “I actually had to stay in the doctor’s office for a solid hour afterward, lying there because I couldn’t get up — I was just in so much pain,” she said. She ended up missing several days of class and having to call her doctor to get stronger pain medication because over-the-counter options weren’t cutting it. After a few days of taking it easy, the discomfort subsided. Despite the difficult experience, Jessica said, it was more than worth it. 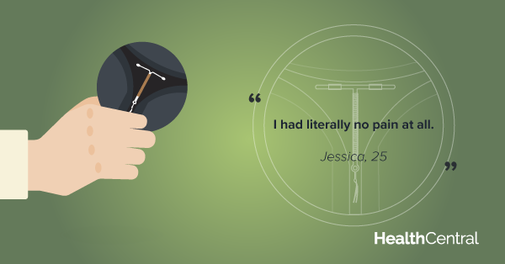 Thanks to the IUD, she hasn’t had a period for the past five years, a side effect she loves. But when it was time to get the IUD replaced recently, she was still filled with dread at the thought of going through the terrible pain again, even though she now had a doctor she was really comfortable with. But to Jessica’s complete surprise, it didn’t hurt the second time — during or after the insertion. But there’s no denying that the insertion can be uncomfortable for some women. A 2014 study showed that the average patient rated IUD insertion pain as a 64 on a scale of 1 to 100, and providers typically underestimated that level of pain. While taking non-steroidal anti-inflammatory agents (NSAIDs), such as ibuprofen, can be effective in treating pain after insertion, there is no clear evidence that methods involving medication (like local anesthesia, taking a drug to ripen the cervix or taking NSAIDs beforehand) significantly reduce pain during insertion — although some health care professionals may offer them anyway. For example, Kristyn Brandi, M.D., F.A.C.O.G., a family planning specialist with Boston University and Boston Medical Center, said there are several things health care professionals can do to make patients more comfortable during insertion, whether that means just holding their hand or making sure they know exactly what is happening. Indeed, several women HealthCentral spoke to about their IUD insertions said the health care provider and clinical setting were reasons why their experiences were more positive. Several mentioned providers who took great care in explaining the process beforehand as well as walking them through each step as it was actually happening. For example, copper IUD-user Gabby Knight, 26, described her insertion as a great experience — and she attributes this to the fact that she had it done at Planned Parenthood. It’s hard to predict what level of pain each woman will have during IUD insertion. One study of women who had never given birth found that a history of severe menstrual pain was the only predictor of pain during IUD insertion. Perhaps this is why Jessica had a more difficult experience the first time around — one of the main reasons she even decided to get the Mirena was to help treat the severe cramps she got during her periods, she said. Additionally, Dr. Brandi said, women who have experienced similar pain before may tolerate the insertion better. “For example, women who have had children before have experienced labor pain, and IUDs are not as bad, so their pain tolerance may be different from someone who has never had a child before,” she said. But more research needs to be done to truly understand how to best alleviate the discomfort than often comes with IUD insertion. For now, the research shows that being educated about the process beforehand and having an experienced health care provider with good bedside manner may be the key. Despite Jessica’s painful first IUD insertion, she said she would still highly recommend the birth control method to anyone.